Driving through Bracknell last Thursday, I came across this set of roadworks. As is normal for council contractors no-one was doing anything, but then I noticed that no-one had done anything previously, other than cone off the road and cause problems for residents. Don't park on double yellow lines... Unless you work for BFBC and it's lunchtime! More 'one rule for you and another for us' from Bracknell Forest Council contractors. Where are the Parking Enforcement morons who prowl the Bracknell streets when this is happening? 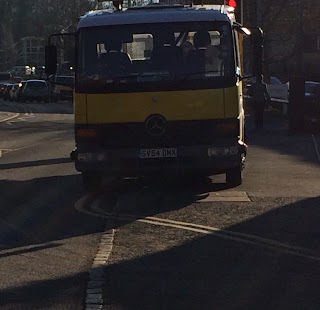 Not only is he illegally parking, but he's doing it right on top of a pedestrian crossing, demonstrating complete contempt for the public, and putting pedestrians in unnecessary danger. Here's the video showing the contractor carrying his lunch back to the van (look for the yellow jacket). Given the number plate isn't visible from the rear (another offence under the Road Traffic Act), there's a front view picture below with his number plate showing. Illegally parked, but why should he worry? The law doesn't apply if you work for the council, right?